Not to be confused with London School of Economics. The School of Economic Science entrance, Mandeville Place, London. The School of Economic Science (SES), also operating under the names School of Philosophy and the School of Practical Philosophy, is a worldwide organisation based in London. Its main activity is to offer non-academic courses for adults, ranging from an introductory series called Practical Philosophy to more advanced classes. Its teachings are principally influenced by Advaita Vedanta, an orthodox philosophical system of Hinduism. It has a guru, Sri Vasudevananda Saraswati, who used the title Shankaracharya until 2017. The SES advertises introductory courses in "Practical Philosophy", "Economics with Justice" and other courses including Sanskrit language. The Practical Philosophy course involves a meditative process known as "The Exercise" and discussion of universal themes drawing on the work of European and Indian philosophers such as Plato, Marsilio Ficino, Swami Vivekananda and Adi Shankara, as well as Advaita. Those who continue involvement beyond 4 years mainly study Advaita; they are encouraged to take up meditation and to undertake voluntary work to help with the running of SES, and to attend residential programmes. SES members have founded schools for the education of children in a number of countries. SES is registered as a charity in the UK; worldwide operations register as non-profit organisations in their own countries. SES was founded in London by Labour MP Andrew MacLaren. His successor and son, SES leader Leon MacLaren (1910-1994), a barrister introduced programs on Advaita Vedanta. SES says it has a total of around 4000 participants in the UK branch and (as of 2012) a total of around 20,000 in up to 80 branches worldwide. Operating under various names, there are branches in America, Canada, Venezuela, Australia, New Zealand, South Africa, Trinidad, Belgium, Cyprus, Greece, Holland, Malta, Spain, Ireland, Hungary, Germany, Israel and Argentina. The head of all of these branches is the SES 'Senior Tutor', MacLaren's successor, Donald Lambie, who is also a barrister. The School of Economic Science was founded in 1938, in the UK, by Andrew MacLaren MP  and his son Leon MacLaren, under the name Henry George School of Economics. It was an economics study group that expounded the economic theories of the American economist Henry George. The group initially met in a Parliamentary committee room of the Houses of Parliament.Leon MacLaren inherited the organisation from his father, Andrew, and changed its focus to "the study of natural laws governing the relations between men in society." He considered science to be a study of laws that already exist in nature; economics the study of human nature and its interaction with the natural universe. The organisation's founders explored new possibilities for a system that would bring about economic justice against the background of the severe economic depression of the early 1930s. Leon MacLaren claimed to have had the idea as early as 1931, when he felt the solution to the economic problems of the day was a school, not "an ordinary school such as one goes to as an child or an adult for post school education" but "something in the manner of Socrates." The Chairman from 1939 was Labour MP for Ipswich, Richard Stokes. In 1943 he mentioned SES in a House of Commons debate on post-war employment when he asked Minister without Portfolio, Sir William Jowitt, if he would consider attending a courses at SES if he did not understand a question about economics. By 1939 more than three hundred people were studying the economics course written by Leon MacLaren. SES was chartered under the companies act of Ontario, Canada as a non-profit body. In 1940 The Blitz prevented the school from opening, but soon afterwards evenings classes booked in a restaurant, the classes widely advertised. MacLaren described how students bravely walked to and from the meetings along streets lit only by the flames of burning buildings. During the Second World War the school offered a correspondence course. In 1942 it ran a series of lectures in Conway Hall on "production" including "An Engineer's War", "The Skilled Man and the Management" and "Give Them the Tools"  In 1943 courses were running in Edinburgh, by 1944 Public meetings and courses were being held in Manchester and Liverpool. In 1945 the Bath Chronicle reported that "Wednesday night's dance at the Pump Room, run by the Fellowship of the School of Economic Science, was a very enjoyable affair"  The Spectator magazine, in 1949, reported that the "complex and fascinating riddles" of economic science were not insoluble, if you can "stump up" the course fee of one Guinea. In 1942 the name of the school was changed to the School of Economic Science, the word 'science' signalled the belief in the existence of natural laws of Economics and a method of direct observation free from personal opinion and vested interest. The method of teaching was inspired by a rabbi and academic professor at the Henry George School of Social Science in Philadelphia, Oscar H Gieger. It was similar to the Socratic method; he formulated questions, which could be read to a group of students, the principle being that the students would find the answers and the lesson would proceed. Some references cite Andrew MacLaren as the founder of the School of Economic Science. SES was founded with the purpose of teaching fundamental principles about economics and political thought without political bias, Andrew MacLaren was heavily involved in this phase. The institution later included philosophy, first with special regard to Oupensky and Gurdjeff and later to Plato and Advaita. Andrew MacLaren was not involved in the development of philosophy programs, which were led by his son Leon MacLaren. The approach to the study of economics, and Leon Maclaren's realisation that economics alone was not enough to answer students' questions, led to the study of philosophy - "the love of wisdom" – in order to gain deeper insights into what they saw as the natural laws governing humanity and the origin of those laws. Courses on Plato were introduced in response to this. SES's predominant interest is philosophy; it defines the subject somewhat differently from conventional Western universities: philosophy is studied for practical living. MacLaren studied the book The Realm of Art (1946), a wide-ranging survey of ideas about the nature of humanity, society, art, science, religion, evolution, creativity, free will, mind and matter, knowledge, and consciousness. It was this book which first introduced him to the ideas of Ouspensky; he incorporated its ideas to the SES and invited the author, Peter Goffin, to give lectures. The Realm of Art concluded that life is a continual choice between expediency and truth, between fixity and growth, "the promise of a new and richer social harmonies in human life, which is given with the capacity for art and the sense of beauty, cannot be fulfilled until man has learned how to control the activities of his conscious mind in accordance with the 'laws' of his own instinctual being - so that beauty becomes connatural to him and his work proceeds from his heart and his bowels as from his lucid mind". The success of lectures on Philosophy given by Peter Goffin made it clear that the School must now move to investigate human nature itself, asking questions about mind, spirit and existence: the study of Man itself. In the late 1940s, Leon MacLaren became influenced by the ideas of Russian philosopher and esotericist P.D. Ouspensky, an important pupil of G.I.Gurdjieff. He then incorporated ideas from their philosophy, called the "Fourth Way", in his teaching at SES. George Gurdjieff, is both praised as a charismatic intellectual who brought greater insight to Western thought, and rebuked as an egomaniacal charlatan who worked followers to exhaustion to break down personality. In 1953, MacLaren met Dr Francis C. Roles, a pupil of Ouspensky who had established The Study Society in 1951 to continue the teaching of the Fourth Way. MacLaren systematised the Gurdjieff system and incorporated these ideas into courses for SES; the ideas were blended with sociology, and man's inner nature was considered in the context of the forces that govern society. Initially, the philosophy material did not quote or acknowledge Gurdjieff, Ouspensky, Dr Roles or Leon MacLaren directly, this due to a belief held by all four that the truth could not be personalised: it belonged to no one man, it belonged to all mankind. When Leon Maclaren died in the mid-1990s, the entire school gradually underwent a change in approach, choosing to be more open about its study programmes in order to prevent misunderstanding. Nowadays, SES seems to have phased out most of its Gurdjieffian material (it no longer uses Leon MacLaren’s lectures) and does not acknowledge Gurdjieff or Ouspensky on official SES websites. Music was one of the common threads running through the philosophy course, initially in the form of the "Law of Three" and the "Law of Seven", as expounded by Gurdjieff and Ouspensky, and later by Ficino in his work on the essential qualities of the notes of the octave. SES established a music group to explore these principles. Ouspensky believed Gurdjieff's teachings were incomplete; Roles and MacLaren were eager to discover the missing elements. In 1959, while searching for the source of the system, MacLaren discovered the teachings of Advaita Vedanta after meeting the Maharishi Mahesh Yogi, and began to practice Transcendental Meditation (TM). Both Roles and MacLaren became pupils of Maharishi Mahesh Yogi. On 13 March 1961, MacLaren organised a meeting called, "1961 World Congress" for the Maharishi in the Royal Albert Hall, two days prior to the event smaller meetings were held at Caxton Hall. The Royal Albert Hall meeting was attended by 5,000 people, nearly all SES members. One attendee described the effect of the talk as "tremendous", causing him to feel like a prisoner that had just been released. He speculated that meditation was the missing link of the incomplete Gurdgeff-Ouspensky system. The particular type of meditation used by SES was developed by Brahmananda Saraswati (Gurudeva) . It is a modified practice of meditation, suitable for the householder engaged in the affairs of everyday life. It differs from methods intended for those who withdraw from society like monks or sanyasi. MacLaren was taken through its initiation ritual, and speculated that he had found the source of Gurdjieff's ideas. Shantananda Saraswati taught that the practice of meditation in a regular and disciplined manner is of the very highest importance. Meditation became central to SES' philosophy program. SES was instrumental in promoting TM in the UK from the 1960s. In collaboration with The Study Society and Maharishi Mahesh Yogi, SES established The School of Meditation (SoM) in London in 1961, under the direction of Bill Whiting. SoM's purpose was, and remains, to study and teach the principles and practical application of meditation. Many of the subsequent leaders of SoM were students of the Maharishi. The School of Meditation is now an independent, self-governing organisation. By 2011, SoM had initiated 15,332 people into the practice of meditation, it has branches in several parts of the UK as well as in Greece and Holland. Both SES and SoM teach the Transcendental Meditation introduced by the Maharishi Mahesh Yogi. Roles and MacLaren went to India and became followers of Swami Shantananda Saraswati, who had been a disciple, with the Maharishi, of the previous Shankaracharya of Jyotir Math, Swami Brahmananda Saraswati. From this point on, MacLaren's teachings became predominately based on Advanta Vedanta, which he disseminated within SES. During the mind 1950s, Practical Philosophy became the central subject of teaching and practice at SES and remains so today. MacLaren's discussions with Shantanand Saraswati solidified the central principle of SES' philosophy as "unity in diversity", a merger of Eastern philosophy and Western wisdom. From 1965, every second year for the rest of his life, MacLaren conversed with Shantananda Saraswati, and these conversations were taped and transcribed. School leaders brought back this wisdom to their groups where it was studied, practised and actualised in the lives of many. These conversations are published in a 4 volume series. Teaching is disseminated by SES advanced students who are volunteer teachers, and is maintained by the successors of Leon MacLaren and Swami Shantanand Saraswati, these being Donald Lambie and SES guru Sri Vasudevananda Saraswati respectively. In his conversations with Leon MacLaren, Shantananda Saraswati stated the importance of Sanskrit language in the study of Advaita. The study of Sanskrit Language at SES began in the late 1960s and became a formal part of what was called the "middle school" in 1977. SES is considered a world-class centre for the study of Sanskrit. The first international school was established in Wellington, New Zealand in 1957. During the next decade, MacLaren’s students established Philosophy Schools and schools for educating children in Europe, the United States, Canada, the Caribbean, New Zealand, Australia and South Africa. The international schools are separately financed and separately governed by their own constitutions, but using teaching material from SES. Each year, MacLaren travelled the world visiting these schools with the message: ‘We come to discover the Truth, the Truth about our Self, the one Self, the one Consciousness that pervades and sustains everything. We speak the Truth, we strive to live according to the Truth.’ He would visit each school, annually, for several weeks at a time, and did so for twenty-one years. In 1975, SES founded the St James Independent Schools in London, comprising one school for girls and one for boys, both catering to children from 4–18 years of age. Today, only around 10 per cent of the children at St James have parents involved with SES. They're ranked in the Sunday Times' top UK schools guide. St Vedast's School for Boys, at Sarum Chase in Hampstead, London, was also founded in the mid-1970s and closed in 1985. Other schools included the Ficino School in Auckland, New Zealand; St James Preparatory Schools in Cape Town, Durban and Johannesburg, South Africa; John Colet School, Sydney, Australia; Erasmus School, Melbourne, Australia; the St James Independent Schools in London; Alcuin school in Leeds (closed in 2009); St James' primary school in Stockport (closed in 2015); and John Scottus School in Dublin. St James Junior Boys merged with the Junior Girls School to form St James Juniors in 2015. After 40 years, the organisers announced that Art in Action would "pause", and that their vision is for Waterperry Gardens to "develop as a centre for the arts in the years to come". Since then the organisation has hosted the Handmade in Britain festival, Celebrating Ceramics, the Oxford Storytelling Festival and the Waterperry Opera Festival. The day before the 1983 UK general election, right-wing London newspaper the Evening Standard reported that Liberal Party chairman Roger Pincham and several other Liberal Party members were involved with SES. The article called SES a cult and contained a lot of pejorative comments about the organisation. The authors lost credibility when multiple errors were identified in their work and it emerged that Margaret Thatcher's Director of Press and Public Relations, David Boddy, was also an SES member. David Boddy commented "It blew their whole story". In 1992 Shantanand Saraswati advised Leon MacLaren to choose a successor. He chose Donald Lambie, a lawyer, who had joined SES aged 17 in 1973. Donald Lambie succeeded Leon Maclaren upon his death in 1994. His succession was approved by the 200-strong Fellowship of senior members of the school. Sri Shantanand Saraswati died in 1997. Donald Lambie established contact with his successor, Sri Vasudevananda Saraswati, who took on the role of guru to SES. Sri Vasudevananda Saraswati continues to act in that role. Following a project by SES architects and artists' groups to plan and construct a new hall at Waterpery House in 1999-2001, frescos spanning three floors, illustrating SES' philosophies, were added to the property to create a sacred space intended to last at least 500 years. The architects and artists let their designs arise from reflection on a passage from one of the great texts of Advaita philosophy, the Brihadaranyaka Unpanishad: "In the beginning this self was indeed Brahman. It knew only itself as 'I am Brahman'. Therefore it became All." In 2001, SES members investigated the findings and impact of the Layfield Committee and the Whitstable Studies into local government sources of finance and the impact and cost of introducing site value rating. In 2006, SES hosted the Progress without Poverty conference; also the conference, "Why Values Matter", a joint conference with the Globalisation for the Common Good Initiative . SES is also a main sponsor of the "Just This Day" event. The event promotes meditation and is held annually at St Martin in the Fields. In 2008, SES hosted a conference titled, "The Primacy of Consciousness". The topic was debated from a variety of philosophical and scientific perspectives. One attendee commented, "the proposition of ‘the primacy of consciousness’ in either context could scarcely be more relevant in the light of the systematic inability of neuroscience over the past twenty years to provide an adequate explanation of the human experience." In 2008 & 2009, SES Economics Faculty presented new courses called "The Science of Political Economy", "Protection or Free Trade" and "The Condition of Labour", based on important works of Henry George. In 2013, SES hosted the conference, "Economics for Conscious Evolution: International Land Taxation". In 2015, SES made written submissions to the Scottish Government Commission on Local Tax Reform. In 2016, the SES branch in the London Borough of Croydon was named one of the 5 best places to find your soulmate. In 2016, SES made written submissions to the London Assembly Inquiry into Land Value Taxation for London. In 2016, SES was invited to participate in the United Nations Harmony with Nature initiate, an online platform of practitioners, academics and researchers dedicated to advancing a world-view based on recognition of the intrinsic value of Nature and of human-Earth relationships that are subject to the natural laws of the Universe. In 2017, SES made written submissions to the House of Commons, Housing, Communities and Local Government Committee on Land Value Capture. In 2019, SES hosted a variety of events related to pluralism in economics. SES said in its financial report for the year 2014 that 55,000 people had attended its courses since 1937. Other sources reported SES to have had more than 100,000 students since its founding and currently has 20,000. According to Hodgkinson, "Hundreds of thousands have attended the schools courses in the UK and in affiliated schools around the world. Some have stayed for a term or two, others have devoted their adult lives to the school." Teaching at SES is done in small groups, in the form of a dialogue between tutor and students following the Socratic tradition, rather than establishing a set course with a curriculum, textbooks and examinations. All of the SES tutors are advanced students; none is paid. Courses include Philosophy, Economics, Art, Vedic Mathematics and Practical Philosophy in Business. SES teaches a variety of 10 week courses, beginning each January, May and September. SES teaches a philosophy drawn from Eastern and Western traditions. Its courses are taken up by those who are interested in self-discovery and searching out a deeper meaning from life. "Unlike philosophy schools that offer a variety of philosophies to be considered, without any real commitment being expected from the pupils, SES is closer to the ancients’ conception in which pupils are taught one particular philosophy or ethical way of life, which they commit to in an effort to completely transform themselves". SES encourages students to discover the first principles, the fundamental laws governing a subject and then to apply them, for example, the understanding and application of the first principles of business could result in one becoming a wise businessperson. An underlying idea is that the great teachings of the world all point to the same central truths, and that wisdom is the key to a better life. Teaching is based on the precepts of Advaita Vedanta as translated, taped and transcribed from interviews in India conducted by MacLaren with Swami Shantanand Saraswati (d.1997), a colleague of Maharishi Mahesh Yogi, from 1961 - 1996. Advaita means literally "not two"; vedanta refers to the knowledge underlying the creation. Together these are said to explain the essential unity of everything in creation and the source from which it arises. This teaching also speaks of 'pure consciousness' as the true essence of every being, and the human possibility of shedding the covers on this essence to allow it to be realised and expressed in its purity. SES considers Advaita to be "the clearest and most systematic expression we have found of the common philosophy that lies at the heart of many of the world’s great religions and philosophies". Non-dual philosophy arises from ancient vedic scriptures expounded by Shankara. This teaching, along with the expansion of it in relation to the modern age by Santanand Saraswati, is the foundation of the philosophy course. The course operates on the principle that the teaching achieves nothing unless put into practice in everyday living. Through practice, it eventually becomes understanding and a part of one's own nature. The initial founder of the school of Economic Science Mr Leon MacLaren first met with the then Shankaracharya of the North, Shantananda Saraswati, in 1964 and under his direction developed the school in London. Since then there has been a regular dialogue between the school and Shantananda Saraswati. These conversations have become an essential part of the study of the School and it became obvious that some of the subject matter that conveyed the essence of this philosophy, should be the basis of the works for the hall. The Advaita Vedanta philosophy is a teaching that is traditionally conveyed orally from teacher to student, containing many stories, analogies, examples, principles, etc. It is not possible to show everything, but a selection has been made for the Waterperry project that would illustrate the main tenets of this philosophy. The introductory philosophy course covers some basic principles, highlighting the main influences that govern human experience. After the introductory course, the various aspects of the subject are examined more deeply and philosophical texts are studied in detail. The material presented is drawn from a variety of sources within the philosophical writings and dialogues, scriptures and other literature of East and West, including the Bhagavad Gita, the Upanishads, the Bible, Plato, Marsilio Ficino, Hermes Trismegistus, Shakespeare and Emerson. As students progress through the school,they don't learn deeper truths, but gain a deeper understanding of the same truth, which they are presented on the first night. Some of the ideas presented in the course have parallels in western philosophy: the idea that the empirical world is constantly changing (Heraclitus), there must be some underlying reality that is unitary and never changes (Parmenides), people’s lives seem to be ruled by ignorance and yet there also seems to be some innate understanding of the finer principles like truth and justice (Socrates and Plato), 'Know thyself' is fundamental for giving a life meaning, philosophical investigations should be guided by the findings and thoughts of those who have gone before but we must question and reflect upon those findings (Aristotle), possessions do not bring lasting happiness it must be sought 'within' (Cynics). Students are asked to not accept or reject the ideas but to test them against their own experience. The objectives of the practical philosophy course can be summarised by a teaching of Adi Shankarar, "You participate completely in your life in the world, with your family and your job, but you come to an inner stillness which lets you meet your true happiness, and at the same time will allow you to be more efficient and more effective in what it is you do. To play this full role in the world, you need to have your intellect fed, your emotions fed, and engage in service." Students are organised in groups of like-minded and supportive seekers, meditation is introduced after the first year and regular support with the practice is provided. The Exercise is a central element of teaching at SES, instructions have been published by the New York Times. In 2017, Allahabad High Court rejected both the claims Vasudevananda Saraswati's and Swaroopanand Saraswati as Shankaracharya of Jyotir Math . Members are encouraged to do volunteer work with and for fellow students, and for the communities in which they live. Service to fellow human beings, without personal reward or gain, is considered important an important part of the organisation's philosophy of seeking the truth. SES host retreats for those students who have graduated from foundation courses, who spend longer periods of time there practising what they have learnt and furthering their study. It is a setting in which students can dedicate themselves more fully to the philosophy. These can be between 2 and 10 days in length. The scope of the SES Economics department is to "study of the natural laws governing the relations between people in society". A four term economics course is taught seeking to show that "Freedom and prosperity are possible for people everywhere, providing we follow economic laws and aim for a fair outcome from economic arrangements"  Courses and studies in economics have continued with the emphasis on "Economics with Justice".Rather than seeing Economics as an isolated field of enquiry, the course has become a study of human beings and their economic customs and practices, it includes a view of the whole of society, justice, ethics, politics and history, as well as the production and distribution of wealth, expanding the students’ viewpoint and revealing the underlying law and harmony in human affairs. Economics is treated as a distinctly human subject whose purpose is to release human creativity and potentiality. A discussion forum fosters open discussion on economics topics. The Economic Monitor is published by the economic faculty and several copies are available online. Economic science is normally considered the mathematical approach to Economics, SES uses a different definition. The view adopted by the course is that justice is the ethical basis of economics and the real measure if economic understanding is whether the policies and practices that flow from that understanding produce justice for all participants. It is critical of the contemporary understand and practice of economics which it claims shows "great accumulations of wealth alongside great poverty", "consumption patterns based on exploitation", and our natural environment systematically undermined and destroyed for profit. The ideas of Henry George are viewed as a means to allowing all humanity to live with justice and equity. The first term sets out basic ideas of economics in the context of economic justice. The second term looks at the historical development of the subject focusing on the main contributors, considered to be: Adam Smith, David Ricardo, Karl Marx, Henry George, Alfred Marshal, John Maynard Keynes and Milton Friedman, and the effect of their ideas on present circumstances. SES has published it's economic theories and principles in a 2013 book "The Science of Economics". SES has made written submissions to the Scottish Government Commission on Local Tax Reform, the London Assembly Inquiry into Land Value Taxation for London, and the House of Commons, Housing, Communities and Local Government Committee on Land Value Capture. It hosted a variety of events related to pluralism in economics. It has been described as "Georgist", but has widened its cope of enquiry beyond George to include financial reform and debt. It has been described as one of three UK organisations working to bring about land tax reform. Meditation is introduced as a personal practice to find stillness and unity in oneself. It has lifestyle benefits like reducing stress and improving concentration. However, it is intended as a means of coming to a deeper appreciation of spiritual unity, and from that appreciation deciding how do you deal with the world around you. The meditation practice is described as leading to inner quiet, of equal value to those who follow a religion or have no particular belief, not a practice of contemplation or concentration, it aids the person meditating in looking inwards and going about their worldly activities. Students are given a specific mantra by SES or SoM, those who have been initiated into the Transcendental Meditation technique are allowed to keep their own mantra. To gain access to this technique requires tuition and initiation to ensure the practice starts in the most beneficial manner, students are supported with ongoing tuition in meditation throughout their time at SES. SES encourages students to meditate for 30 minutes, twice a day, however it is accepted that not everyone can live up to this ideal, shorter daily periods are considered better than none at all, two periods per day of just 10-15 minutes are recommended for beginners . The mantra-based meditation technique is described as one that does not use the thought process in any way, it is not one of contemplation or concentration, it involves "dropping down through subtler levels of mental processes down to a deeper level of being, beyond the movements of the mind". The benefits of this are said to include allowing people to find their own inner peace and happiness, letting go of inner pursuits, as well as possibly helping to bring a deeper understanding of their own cultures, teachings and traditions. It is acknowledged that while practising meditation a person's habitual tendencies still remain and they still have to face the circumstances of life, however difficulties and differences will be seen a new perspective and they can be addressed with greater ease and effectiveness.The process of meditation takes you from an agitated mind to a state of stillness, and that which takes you there is the mantra. Mantra is a Sanskrit word composed of two elements: man (which rhymes with sun) means ‘mind’ (and is also the source of the word ‘man’), and tra means 'release', therefore a mantra is that which gives you release from your mind. The technique involves sounding the mantra inwardly with full attention, but without excessive effort. When it is moving along, repeating evenly, and you have given it momentum, you just let it go into the space of the mind. The special sound, which is given by a teacher or guru, occupies the attention, allowing the mediator to leave everything else. The sound of the mantra, believed to carry a special energy or vibration, is said to lead the mediator back to a place of deep stillness and inner rest, an oasis in the midst of a turbulent world, a depth of experience that is well beyond the day-to-day norm. Maharishi Mahesh Yogi, describing the benefits of this method of meditation said: "Meditation is like watering the root and supplying nourishment to all aspects of the tree. Watering the root can be defined in terms of the growth of leaf, also watering the root can be defined in terms of the growth of the branches, also in terms of growth of the flower, also in terms of growth of the fruit. So watering the root can be defined in numberless ways with respect to the effects it produces in all parts of the tree. Now, like that Transcendental Meditation can have innumerable definitions because it produces effects in all the phases of life". Shantanand Saraswathi described this meditation method as "the master key to the knowledge of Vedanta", "There are other keys, but a master key is enough to open all the locks". In the School, a traditional system of mantra meditation is made available to all students who have taken Philosophy Works followed by the Foundation Courses. Seated comfortably in a balanced and upright position, the activities of the mind and body are brought under observation, and then allowed to fall away as the attention is directed to the sound of the mantra. This results in an experience of quiet stillness. Remaining still and listening to the sound of the mantra is all that is required. The rest unfolds naturally. The introduction to meditation is marked by a simple, dignified ceremony. Students are asked to present traditional offerings of fruit, flowers and a gift of money that is used solely for making meditation available throughout North America. Following the introduction, ongoing assistance is offered in the form of one-on-one tutorials and classroom discussions. SES spokesman David Boddy, described the mantra as like a model sailing boat, attention is the power of momentum. So, with full attention, gently push the mantra out into the ocean of the mind, listen, and remain aware of what is happening. The benefits of setting aside twenty minutes twice a day for this type of meditation are said to be that it enables the brain to be quiet and tranquil. It helps people think more clearly and positively, to have creative ideas, and to cope with the stress of busy life. People sleep more soundly. It also elevates the good-mood neurotransmitters in the brain, and because it acts on the brain directly it is much more than just another relaxation technique. SES members have contributed to the BBC programs on renaissance topics, in 2005 providing incites into the historical meaning of the word heaven and its possible implications, and in 2009 on of the influence of Plato and Aristotle on the Renaissance. SES has been an informal networking centre for individuals interested in Ayurveda, however, it has never taken any formal initiatives related to ayurvedic medicine. Since the 1970s some well-known ayurvedic practitioners have had loose associations with the SES. Donald Lambie is supported by a nine-member Executive Committee elected by the 230-person governing body of the SES, known as the 'Fellowship'. It has 240 'Ordinary Members' and 41 'Associate Members' in its Fellowship. The principal of SES is Ian Mason, a barrister  and a global facilitator for the UN Harmony with Nature project. To promote the study of natural laws governing the relations between men in society and all studies related thereto and to promote the study of the laws customs and practices by which communities are governed and all studies there to. Any person Enrolled on a Philosophy of Economics course can be invited by the Executive Committee to become an Ordinary Member of the Fellowship. In the UK courses are held in nearly 50 towns and cities. In 1972 the UK branch of SES purchased the Waterperry Estate in Oxfordshire, including its horticultural business, which it continues to run to generate revenue for the school, in 1986 Nanpantan Hall in Loughborough was bequeathed to them, they also own Brinscall Hall in Preston, as well as eleven further freehold properties and one long leasehold. These include Mandeville Place in London, Belmont House in Stockport, Park House in Glasgow. Other properties are in London, Leeds, Croydon, Edinburgh, Guildford and Colchester. In 2005, the SES sold one of its mansions, Sarum Chase in Hampstead, for £9.3 million. In 2017 the UK charities commission shows the organisation had an income of £5.1m and spending of £4.0m. The organisation also has £15.5m of own use assets, £10.0m of long term investments, and £2.3m of other assets. The UK organisation has 9 trustees, 98 employees, 500 volunteers and lists its area of operation as the UK. Slightly more than half of the tutors and half the students are female. SES has been described as an "exclusively a British organisation". Apart from two office staff, all the School's work is done on a voluntary basis, including the teaching, this includes the Senior Tutor, Donald Lambie. In addition, nobody is allowed to profit commercially or financially from any association that they have in the School. SES is one of the most widespread organisations related to Advaita, in addition to the campuses in the United Kingdom, most of which are called The School of Economic Science, there are several dozen associated branch organisations worldwide, most of which are called the School of Practical Philosophy or some variant of that name. The first such operation was established in Wellington, New Zealand in 1957. Another sources shows the in Canada SES was chartered under the companies act of Ontario as a non-profit body in 1939. One of the best known is the School of Practical Philosophy in New York City, founded in 1964. here are branches in USA, Canada, Venezuela, Australia, New Zealand, South Africa, Trinidad, Belgium, Cyprus, Greece, Holland, Malta, Spain, Ireland, Hungary, Germany, Israel, Fiji and Argentina. The international schools are separately financed and separately governed by their own constitutions, but using teaching material from SES. According to the spokesperson for the New York branch, Dr Monica Vecchio, SES and the School of Practical Philosophy are "the same thing with different names. There are 70 or 80 [branches] around the world. Each share the same course curriculum, with the same content. The principles are the same, the practices are the same, the stream of discussion is the same." A branch of the organisation called the School of Practical Philosophy opened in 1964 in New York City. The New York facility was launched in 1964 as a not-for-profit corporation chartered by the Board of Regents of the State of New York. It received tax-exempt status in 1982. It has branches in the Hudson Valley; Rochester, New York; Albany, Georgia; Scottsdale, Arizona; South Florida; San Francisco; Boston; and the state of New Jersey. The main branch is located at 12 East 79th Street in Manhattan. There is an additional property in Wallkill, New York, in a mansion once owned by Marion Borden. It bought an Upper East Side mansion from millionaire Charles Ogden in 1975, and put it on sale in 2014 for $51 million. Many New Yorkers are aware of the School of Practical Philosophy and its 10-week foundation course, Philosophy Works, due to extensive advertising in the subway, featuring the taglines "this poster can make you happier than any other on the subway" and "sustainable happiness". The Philosophy Works series is offered several times a year. The actor Hugh Jackman has been involved with the organisation since 1993. The organisation has been described in a variety of different ways: a "human potential movement", as providing "mind discipline" for achieving mental quiescence, as cult, or new religious movement, as a non-religious organisation, or a platonic community, a "Gurdjieff fringe group" or neo-Gurdjieffian movement, as "Georgist". Commentators have pointed out that SES members do not consider it to be a religion, rather a philosophy, and some members for example may well be committed to mainstream churches. SES state that "Advaita does not stand in the place of religion. Rather, as many students in the School of a religious disposition have found, it has the capacity to expand and deepen an understanding of their own religion, whatever it may be. It is equally valuable for, and applicable to, those who practise no religion." Shantanand Saraswati stated that people do not need to change their religious beliefs to follow the principles of Adviaita. In the early 1960s, British Buddhist teacher and writer Sangharakshita (Dennis Lingwood), returned to England after 20 years in India. His book Moving Against The Stream includes descriptions of SES member Terry Delamare's experience at the organisation during this period. SES is described as "the organisation whose meetings Terry attended most regularly, and whose teachings he took most seriously" during difficult times. The philosophy taught was described as "a curious amalgam of Western Esoterism and brahminical Advaita Vedanta. ","The School’s teachings were therefore sufficiently broad, not to say eclectic. Students moreover were encouraged to read the philosophical and religious classics of both East and West. In particular, it seems, they were encouraged to read Plato". The author also states SES regarded the music of Mozart, in particular, as having a positive, spiritualising effect on the mind. Lingwood concludes "Contact with the School of Economic Science had, in fact, widened his (Delemare) intellectual horizons, and he had much to be thankful to it for". In 1983, the day before the UK General Election, reporters Peter Hounam and Andrew Hogg, writing in the London Evening Standard, made allegations that it was a cult infiltrating the corridors of power via the Liberal Party. They made several pejorative allegations including, "enforced a severe diet, persecuted women and kept its members closed off from the outside world". They also criticised the School of Economic Science's links to the St James Independent Schools for children in London and the discipline regime at the children's schools. The authors lost credibility when multiple errors were found in their story and it was discovered that David Boddy, Margaret Thatcher's press secretary, was also a member of SES. Boddy stated, "That really upset them when they found that out". The articles were described as "largely politically motivated". SES leadership initially chose to ignore these allegations. In 1984, Houman and Hogg wrote a book, Secret Cult, which said that the organisation aimed to establish psychological control over its members and had caused personality change, mental breakdown and divorce. They did not consider every SES member to be a cult member; they excluded, for example, the thousands that attend only the introductory courses and potentially those in the senior echelons that live normal lives; of concern was a group they called the 'lumpenproletariat' who joined after the religious fervour of the 1960’s and are "dependant on SES to make decisions in their lives". They also claimed the SES was "penetrating the corridors of power" with particular links to the Liberal Party, whose then chairman, Roger Pincham, was an SES member. The book contained a reply from Pincham disputing the claims, and also included interviews with ex-students who said they had gained much from their attendance. The authors commented that, in hiding from publicity, the School might have made secrecy its worst enemy. Other commentators stated that "Secret Cult" was a sensationalist account containing many inaccuracies" and that it "lacked scholarly objectivity in places" and contained some controversial claims; some also state SES was secretive, which was part of the problem, but are now open about their activities following consultation with Shantanand Saraswati. Colin Slee, Provost of Southwark Cathedral, who had collaborated in the Secret Cult and was then happy to "see SES as a cult", in 1999 reported a shift in his attitude to SES later considering it to be a New Religious Movement instead. University of Sydney professor, J Petsche, wrote on the Secret Cult: "by journalists Peter Hounam and Andrew Hogg from the right-wing Evening Standard, Secret Cult had a blatant political agenda; it was discovered that several leading members of the Liberal Party were members of the SES, and the publication of Secret Cult was timed to coincide with the 1984 General Election. Hounam and Hogg lost credibility when a string of errors was identified in the book, and when it was discovered that the spokesman for the SES, David Boddy, had in fact been a press adviser to Margaret Thatcher. For many years, Secret Cult was the only major "outsider" source on the SES, leading to a consistently one-sided and misinformed picture of the group. As a result, MacLaren’s birth year has been persistently quoted incorrectly as 1911; Andrew MacLaren, rather than his son Leon, has been attributed as founding the SES; and MacLaren is believed to have been designated "Master" by pupils (when in fact they called him "Sir"). Other strange allegations, such as MacLaren arranging marriages within the group and banning the use of refrigerators because they kill the life force, are also untrue." Another author stated Secret Cult to be "a particularly good example of how tabloid sensationalism can create considerable amounts of smoke from not very much fire". Journalist William Shaw wrote a 1994 book Spying in Guru Land: Inside Britain's Cults, in which he attended SES along with several organisations that have been branded cults, in order to paint a truer picture of members. On cults, he states "they become cults when we think of them as cults." He challenged the suggestion SES was a cult, saying "I witness nothing that could be called thought reform, or brainwashing. The yearning dedication of those who stay, turning up week after week in their quest for the big answer to life, is somehow ignored by those in the anti-cult movement who try to tell us that behind the fluty-voiced Miss Crammond lurks a malicious agent of mind control." Shaw was critical of Secret Cult by Houmam and Hogg, saying "This book is a perfect demonstration of how, if you start looking for a malignant cult, that is exactly what you will find." He said Houghman and Hogg assumed SES members had taken positions as lawyers, churchmen and politicians because they were in a cult, missing the obvious conclusion that they were SES members "simply because they shared the elitist upper-middle-class professional values that the school espoused." As he left the organisation, Shaw says he felt like a "posh schoolboy at an earnest, well-meaning, stolid, self-satisfied public school." In 1994 Religious Studies Lecturer at the University of Wolverhampton, George Chryssides wrote: SES does not consider itself to be a religion, it runs classes in philosophy, "by which is meant Vedic philosophy", with some Christian and Esoteric elements, together with the practice of meditation. It is an exclusively British organisation. Sociologist of Religion, David V. Barrett, in his 2001 book The New Believers, based partly on interviews with David Boddy he described SES a not a religion, but at the heart of its teaching having a very distinctive philosophy which draws on elements of Christianity and esoteric origins and beliefs but is largely Eastern. The path of the SES is "a case of personal development rather than attaining knowledge". He points out SES follow the teaching of the Shankaracharya because they say "his wisdom, which we have followed, works"; SES do not claim to have a monopoly on the truth, there are some for which it is appropriate and some for whom another method is appropriate. Writing in the Times in In 2008, journalist Richard Morrison, observes that SES was behind Oxfordshire arts festival, Art in Action. He states "I know people who have found the SES to be a helpful and entirely benign influence on their lives; and others who have encountered it and found it weird. Not for a moment do I expect Art in Action to be anything other than a showcase for high-quality craft skills." In 2010, Ariel Kiminer of The New York Times noted that passengers on the New York City Subway were familiar with an advertising placard from School of Practical Philosophy which stated: "This poster can make you happier than any other." She said she attended the introductory course, for which 400 people signed up, and that after the initial meetings, attendance fell off considerably and she started to dread it. Responding to accusations that it is a cult, she said "If so, it must be an unsuccessful one: no one tried to sign me up for the next course, let alone get me to donate my earthly possessions." [check quotation syntax] In 2011, M. H. Miller of The New York Observer alleged, based on the testimonies of some former members, that the organisation had caused divorce and child abuse and that its leadership had ingrained sexism and homophobia. He said that its practices are "obscure bordering on impenetrable" and "follow a hierarchical structure in which students advance to new levels of study with money and time, but are not told the specifics of what awaits them when they do." Miller reported an allegation by a former member that the organisation seeks to "gain control over students by a slow process of conflating obedience to God with obedience to those who claim to know God–that is, S.E.S. and its "tutors." In his 2012 book Confusion No More, Vedanta teacher and disciple of Nisargadatta, Ramesh S Baleskar, includes the accounts of a student of the School of Philosophy, the SES branch in Holland. The student had been at the school for 12 years and describes it as inviting and stimulating resulting in a "complete change in the way I looked at things".The philosophy course is described as involving a "lot of practising, exercises, meditation - a lot of volition", "there were some very clear experiences of peace of mind". His experiences led him to further explore Advaita. In 2019, a writer for The Outline enrolled in the School of Practical Philosophy introductory course. She reported that "There was something surreal about leaving work on Thursday evening and taking the subway to a mansion where I would be told a bunch of weird lies." She read Secret Cult midway through the course and commented that "it was hard to square its horror stories with the SPP, which, like a lot of Americanised British things, wasn’t quite as compelling as the original." The reviewer opined that it seemed strange the SPP had so much money and attributed it to low overhead. She observed that "teachers are unpaid, students perform custodial work, and the SPP owns its own building." In 1963, writing in Land & Liberty, A J Carter describes coming "into contact with one of the most important influences on my development" at SES. The economics program introduced him to, land-value tax and Progress and Poverty, by which "a vital seed was sown, but it was not yet to flower". The philosophy course he describes as "directly and indirectly, altered my whole outlook on the deepest aspects of life." On 26 May 1982, Roger Pincham, who had been a member since 1955, wrote a letter to The Evening Standard challenging criticisms made by Hounam and Hogg. He said that an account based on the views of a few disaffected former or current students, or on reporters’ attendance at programs on two or three occasions, could not present a balanced view. He said that thousands of students have attended the program over the preceding four decades and most have gathered great value from doing so. He added that the authors had mischaracterised the relationship between SES, the independent day schools founded by some of its members, and the Liberal Party, suggesting that the journalists had distrusted the organisation simply because it was "new and rather unusual". Commenting on the book Secret Cult, school member and author Brian Hodgkinson responded to its claim that the program encourages "destroying the personality". He said that description conceals the actual focus of the teaching, which is to free the mind from the limitations imposed by the ego. He added that "of course, no actual force was used. The whole teaching of the school is word of mouth. Anyone can walk away from a School meeting or event at any time. Some do!" Hodgkinson later wrote a history of the school called In Search of Truth: The Story of the School of Economic Science, published in 2010. It included details of the school’s economic and philosophical thought, and examination of positive and negative aspects of the organisation. In response to claims that some people had become emotionally disturbed while attending the program, he pointed out that such cases may have been caused by "outside circumstances, such as family relationships or careers" or pre-existing mental health problems. He added, "When they sought help from help from School tutors, the advice given may sometimes have exacerbated the situation, but there have been a great deal more cases where tutors' help has been much appreciated." In her 2002 book, Nothing Left Over: A Plain and Simple Life, Tionette Lippe, who attend SES in London and New York, describes how she remained in this organisation for a "considerable number of years, studying the philosophy of many of the world’s great traditions, and what I heard and put into practice there laid the groundwork for the rest of my life". Her own philosophy of wanting to be of service to other people and share with them whatever has comes her way, to live so that supply does not exceed demand or consumption; and to trust that the universe will respond to you in the same way that you respond to it, is of no surprise as she "began my training at a place called the School of Economic Science!". Author of the 2007 book, There’s No More Dying Then, Stephanie Wilson a consultant Histopathologist at St Mary’s Hospital London, was confirmed into the Church of England at an early age and saw Christianity as a good thing. However, during her career as a junior doctor, doubts started to arise and she found her faith did not answer fundamental questions such as "who am I?" or "why am I here?". The exploration of eastern philosophy shed new light on what faith is, and illuminated what she already knew about Christianity. Wilson says "the effect on me of further exploration of the words of the wise opened the heart and brought light to my mind". In her 2009 book The Power Within, MacLaren's secretary Doreen Tolly wrote: "The philosophy course he (MacLaren) had developed over the years had slowly become a life-changing method with all its consequences. The advertisements were not explicit enough and did not indicate that one’s habitual patterns of life would come under scrutiny.". "In spite of attempts to malign Leon MacLaren and his methods his critics were vastly outnumbered by his supporters and none of the sceptics have ever been able to explain why so many thousands of discerning people flocked to the school". Author Dennis Waite, studied Advaita for over fifteen years and was a tutor at SES for five years says he joined the school when he was pretty dissatisfied with life "and ripe for beginning my own search for meaning". He described SES as "the only source I had found which gave some slight promise of providing answers to my angst". Waite States "the school provides a valuable introduction to Advaita and can be highly recommended." In July 2012, political advertiser Jeremy Sinclair CBE, chairman of M&C Saatchi, told The Drum that outside of work, his other passion is teaching at the SES. "The philosophy that I teach is to be useful, and not just about mind expanding," he said. He added that it has "heavily influenced" his book, Brutal Simplicity of Thought. His colleague Tim Bell thought SES gave Sinclair a sense of equilibrium, keeping him well enough balanced that he never got affected by blowups at the agency. in 2013, Martha Dewing, raised Episcopalian, now an Interfaith Minister, said studying Advaita Vedanta at the School of Practical Philosophy in New York changed the way she saw her inherited faith. Stating "It opened me up and broadened my perspective" and "I see a bigger Jesus. I see what he meant rather than what they say he said.". Dewing's two primary spiritual practices are mantra meditation twice a day, and a heartfelt practice of gratitude. In his 2018 book Mindful Philosophy, author Michael Snow, who has been a student at SES for over 30 years and a tutor for 20, concluded from his studies that underpinning all religions lies a unitive or non-dual essence that can be realised by anyone so moved, irrespective of religion or culture. This realisation can be undertaken in a non-religious or secular manner. In a 2014 interview in the Daily Telegraph, actress Emily Watson, whose mother was a respected teacher at the girls' school, said she had experienced SES as a child. She described its central teaching of Advaita Vedanta as "a kind of spiritual communism where everyone is one and the same" At its day school, she said children were treated with "a sort of emotional cruelty that was utterly out of place in a place of education that purports to be based on love and understanding." In 2017, Watson added: "It was just very... ideologically different. I look back and I'm grateful to some parts of it and angry about others. Life is a complicated beast." In the Irish Independent, on 30 September 2000, Watson is quoted as saying on St James school in Notting Hill Gate. "I loved it" , "I had a good time there. It's very alternative and you do Sanskrit and meditation and philosophy. It was quite strict. It was very disciplined and it was also experimental in that it had only just started up. …". On SES she said: "The School of Economic Science has been labelled a cult, which is rather ludicrous I think. It's a community. I still go to meditation sessions." David Boddy, former press secretary to Margaret Thatcher, who would later become Headmaster of St James' Senior Boys School, describes the founding headmaster as "an ex-businessman, extremely charismatic in his own idiosyncratic way and the kind of man you would totally trust. The fact that he was a strict disciplinarian – a quality that later landed him in hot water with former students who objected to the caning in his regime – was of tremendous appeal. We knew he was as generous with his love and guidance to our sons as he was firm". Boddy's three sons attended the school from ages four to eighteen, he says "Their generosity and mental acuity became a frequent talking point amongst my political friends, many of whom later visited the school or attended its events." In 2011, invited by a reporter to reply to allegations that SES and its branches are a cult, spokeswoman Monica Vecchio said: "I've known Mr MacLaren for many years," referring to SES leader Leon MacLaren. "I met him when I was a very young woman in my 20s. For anybody to call anything Mr MacLaren started a cult is just ridiculous. I've never met a man who was more a man in the greatest sense of the word than Mr MacLaren was." In 2012 David Boddy, former SES spokesman and Thatcher press secretary, describes MacLaren as "my first mentor" and "my first real teacher", "He knew things others didn’t appear to know, and he was totally fearless when it came to proclaiming them. He couldn’t abide ‘experts’ or religion but he did believe that humankind could be lifted out of its torpor and misery by the power of philosophy, or love of wisdom.". He said "the London Evening Standard sought to brand MacLaren a 'cult leader' because of his Indian connections. ", the book led to "severe misunderstanding, and in some cases libel and slander". He points out that "the School of Economic Science, which has never had a political or religious agenda; it is, in fact, a rather interesting, if somewhat pedantic, philosophical school in the classical Platonic tradition." According to the SES's 2013 website, its critics "greatly misrepresent the aims and activities of the School, but they have alerted it to the need to provide more information about the way its courses and associated activities progress." SES representative Ian Mason responded to criticism in Jules Evans’ 2013 book. He said: "The idea is not to break down the ego for the sake of it, but rather to put you in touch with yourself, to help you distinguish what's real or not, and to nourish and strengthen the mind. But perhaps there was too unquestioning an attitude to the leader in those earlier years. People took things that MacLaren said and applied them without intelligence." About the parties reported by Evans, Mason said, "The balls were a response to requests from young women for opportunities to meet some eligible young men in the SES and were pretty innocent occasions. I should emphasise that there was no coercion involved." In a 2013 interview with Voice of America Mason stated that life is a voyage of discovery and deepening understanding and the courses are designed to support this. The participants are the judges as to the successes of the programs, no certifications are offered, the aim is to liberate people. It’s really about being the best kind of person you can be, knowing your potential. Notable members include former Liberal Party chairman Roger Pincham, M&C Saatchi chairman Jeremy Sinclair CBE actor Hugh Jackman, Margaret Thatcher's press secretary David Boddy, MP Richard Stokes, actress Emily Watson, Canadian entrepreneur Douglas Freeman. The Laws of Manu, a new translation. ^ a b c d e f g h i Evans, Jules (2013). Philosophy for Life: And Other Dangerous Situations. Rider. p. 281. ISBN 978-1-84604-321-5. ^ a b c d e f g h i j k Miller, M. H. (24 May 2011). "Poster Children of New York's Happiness Academy – The School of Practical Philosophy". New York Observer. Retrieved 15 December 2013. ^ a b c d e "School of Practical Philosophy - Worldwide". School of Practical Philosophy. ^ a b c d e "Report of a Private Independent Inquiry Commissioned by the Governors of St James Independent Schools and held in London between 20 June - 6 October 2005" (PDF). ses-forums.org. ^ "Advaita". Encyclopædia Britannica. 19 February 2015. ^ "Horizons - Saturday studies Archives". School of Economic Science. Retrieved 6 February 2019. ^ a b "The Exercise". The New York Times. 15 January 2010. ISSN 0362-4331. Retrieved 5 March 2019. ^ a b c d e Kaminer, Ariel (17 January 2010). "Taste. Smell. Ahhhh, Wisdom". The New York Times. ^ King, Richard (1999). Orientalism and Religion. Routledge. pp. 135–6. ^ "What is Advaita philosophy?". School of Economic Science. ^ a b c d "What is the School of Economic Science (SES)?" (PDF). INFORM. 2007. ^ a b c d e f g h i j k l m John, Adago (2018). East meets West. London: Program Publishing. p. 42. ISBN 978-0692124215. ^ a b c d e f g h i j Hodgkinson, Brian (2010). In Search of Truth: The Story of the School of Economic Science. Shepheard-Walwyn Publishing. pp. 122, 28. ISBN 978-0-85683-276-5. ^ a b c d e Tolley, Dorine (2009). The Power Within: Leon MacLaren, A Memoir of His Life and Work. p. 150. ISBN 978-1-4392-1030-7. ^ a b c d e Clarke, Peter B. (2006). Encyclopedia of New Religious Movements. London: Routledge. p. 562. ISBN 978-0-203-48433-3. ^ a b c d e f "The Fellowship of the School of Economic Science: Report and Financial Statements For the Year Ended 31 December 2014" (PDF). Charity Commission. ^ a b "International Affiliates". The School of Practical Philosophy. 2015. Archived from the original on 17 November 2015. ^ a b "Recent History". The School of Practical Philosophy. 2014. Archived from the original on 6 February 2015. ^ a b Nonko, Emily (6 April 2016). "Size Mattered: Upper East Side Mansions of the Gilded Age Retain Their Cachet". New York Observer. Retrieved 3 March 2017. ^ "The First Hundred Years". Land & Liberty Magazine. 1923. ^ Land and Liberty, Henry George Foundation of Great Britain, 1933 p.231; 1935 p.89; 1936 p.94, 1937 p.97. ^ Land and Liberty, 1936 pp.129, 161, 164. ^ Stewart, John (2001). Standing for Justice. Shepheard-Walwyn Publishing. p. 65. ISBN 978-0-85683-194-2. ^ a b c MacLaren, Leon; Makewell, Raymond (2013). The science of economics : the economic teaching of Leon MacLaren. Economic teaching of Leon MacLaren. ISBN 9780856832918. OCLC 827258190. ^ a b Hodgkinson, Brian (2010). In Search of Truth: The Story of the School of Economic Science. London: Shepheard-Walyn (publishers) LTD. pp. 248, 29. ISBN 978-0856832765. ^ "Post-War Employment - Hansard". hansard.parliament.uk. Retrieved 4 March 2019. ^ a b "Canada". Land and Liberty: 205. December 1939. ^ Hopkinson, A (September 1942). "Economics". Journal of the Royal Society of Arts. 90. ^ "Education". The Scotsman. 17 March 1943. ^ "Is Economics Dry As Dust?". Liverpool Daily Post. March 1945. ^ "Announcements". Manchester Evening News. 6 June 1944. ^ "Bath Chronicle and Weekly Gazette". Bath Weekly Chronicle and Herald. 188 (9582). 24 March 1945. ^ "The School of Economic Science at rr, Suffolk Street, has". The Spectator: 5. 6 May 1949. ^ a b Cusack, Carole. "Both Outside and Inside: 'Ex-Members' of New Religions and Spiritualities and the Maintenance of Community and Identity on the Internet". In George D. Chryssides and Stephen E. Gregg (eds), Beyond Insider Outsider Binaries: New Approaches in the Study of Religion, Equinox, 2018, Forthcoming. ^ a b c d e f g h i j k l Petsche, Johanna J. M. (2015). "Gurdjieffian Overtones in Leon MacLaren's School of Economic Science". International Journal for the Study of New Religions. 6 (2): 197–219. doi:10.1558/ijsnr.v6i2.28443. ^ a b c Chryssides, George D. (1999). Exploring New Religions. Continuum International Publishing. p. 374. ^ a b c d Shaw, William (1994). Spying in Guru Land: Inside Britain's Cults. Fourth Estate. ISBN 978-1-85702-152-3. ^ HIll, Malcolm (2015). Enemy of Injustice: Life Of Andrew MacLaren. Stoke-on-Trent: Just Democracy Books. ASIN B014X9OCW0. ^ a b c d 1945-, Chryssides, George D., (2012). Historical dictionary of new religious movements (Second ed.). Lanham, Md. : Scarecrow Press. ISBN 9780810879676. OCLC 828618014. ^ a b Goffin, Peter (1946). THE REALM OF ART. Lindsay Drummond. ASIN B000XEGRM8. ^ Stewart, John (2001). Standing for Justice. Shepheard-Walwyn Publishing. p. 67. ISBN 978-0-85683-194-2. ^ Tolley, Dorine (2009). The Power Within: Leon MacLaren, A Memoir of His Life and Work. pp. 76–77. ISBN 978-1-4392-1030-7. ^ a b Petsche, Johanna (2015). "Gurdjieffian Overtones in Leon MacLaren's School of Economic Science". International Journal for the Study of New Religions. 6 (2): 195. ^ a b c d e f Blood, Linda (1985). "Book Review: "Secret Cult: The School of Economic Science" by Andrew Hogg and Peter Hounam". Cult Observer. 2 (9): 17–19. Archived from the original on 21 December 2013. ^ "Home". The Study Society. Retrieved 15 November 2013. ^ a b c d Rush, Andy (6 May 2016). "The history of Nanpantan Hall". loughborough. Retrieved 22 February 2019. ^ Petsche, Johanna J. M. (2015). Gurdjieff and music : the Gurdjieff/de Hartmann piano music and its esoteric significance. Leiden. ISBN 9789004284425. OCLC 892055973. ^ a b MacLaren, Leon (2013). Music : the foundations of harmony (Revised ed.). London: School of Economic Science. ISBN 9780956596840. OCLC 874928840. ^ a b 1943-, Rawlinson, Andrew, (1997). The book of enlightened masters : western teachers in eastern traditions. Chicago: Open Court. ISBN 0812693108. OCLC 36900790. ^ 1940-, Wellbeloved, Sophia, (2003). Gurdjieff : the key concepts. London: Routledge. ISBN 9781135132491. OCLC 842264578. ^ a b c d e f g h i j k l m n o p q r s Barrett, David V. (2001). The new believers : a survey of sects, cults, and alternative religions. London: Cassell. ISBN 978-0304355921. OCLC 44933824. ^ a b c Ebon, Martin (1968). MAHARISHI, THE GURU: An International Symposium (First ed.). Signet Books. p. 129. ASIN B00005WBYQ. ^ a b c d e Whiting, F. W. (1985). Being oneself : the way of meditation. London: School of Meditation. ISBN 978-0951105603. OCLC 17234389. ^ J.,, Snow, Michael. Mindful philosophy. Milton Keynes. ISBN 9781546292388. OCLC 1063750429. ^ a b c 1948-, Waite, Dennis, (2010). The book of one : the ancient wisdom of Advaita ([2nd ed.] ed.). Winchester, UK: O Books. ISBN 9781846943478. OCLC 573397586. ^ "History of the School - School of Meditation". www.schoolofmeditation.org. Retrieved 18 February 2019. ^ a b 1925-2018., Sangharakshita, Bhikshu, (2003). Moving against the stream : the birth of a new Buddhist movement. Birmingham: Windhorse. ISBN 1899579117. OCLC 51870972. ^ Rawlinson, Andrew (1997). The book of enlightened masters: western teachers in eastern traditions. Chicago: Open Court. ISBN 978-0812693102. OCLC 36900790. ^ The Fellowship of the School of Economics (1994). A Celebration of the Life of Leon MacLaren. London: Royal Festival Hall. ^ Hodgkinson, Liz (2016). Dadi Janki A Century of Service. ISBN 9788184303827. ^ Douglas, Paul (2010). Language and truth : a study of the Sanskrit language and its relationship with principles of truth. London: Shepheard-Walwyn. ISBN 9780856833700. OCLC 704434256. ^ Elias, Richard (1997). Annual Language Lecture 1997. London: School of Economic Science. p. 93. ^ a b "Overseas Schools". School of Economic Science. Retrieved 10 January 2019. ^ a b c d e f g "SCHOOL OF ECONOMIC SCIENCE (Religious Movement)". what-when-how.com. Retrieved 17 February 2019. ^ 1945-, Jackson, Robert, (1993). Hindu children in Britain. Nesbitt, Eleanor M. Stoke-on-Trent, Staffordshire, England: Trentham Books. ISBN 0948080736. OCLC 29847701. ^ "Information about the School" (PDF). St James Senior Girls School. 2015. Retrieved 3 February 2017. ^ Times, The Sunday. "Parent Power 2019: Best UK Schools Guide". ISSN 0140-0460. Retrieved 6 March 2019. ^ "Sanskrit script opens the path to spirituality and helps improve focus | Saturday Star". www.iol.co.za. Retrieved 2 March 2019. ^ "St James Juniors". stjamesschools.co.uk. ^ Katoch, Prakash (9 February 2016). "Sanskrit and Vedas – what the learning means". Hill Post. Retrieved 12 March 2019. ^ "The joy of daydreaming". 31 May 2010. Retrieved 12 March 2019. ^ "Sanskrit script opens the path to spirituality and helps improve focus | Saturday Star". www.iol.co.za. Retrieved 12 March 2019. ^ Ranganna, T. S. (23 December 2013). "London school teaches students Vedic maths". The Hindu. ISSN 0971-751X. Retrieved 12 March 2019. ^ V., Barrett, David (1996). Sects, cults, and alternative religions : a world survey and sourcebook. London: Blandford. ISBN 0713725672. OCLC 36909325. ^ "Press Release January 2012" (PDF). Art in Action.org. Archived from the original (PDF) on 18 May 2012. Retrieved 15 October 2013. ^ Pearey, Julia (May 1998). "Getting in on the Art". Illustrated London News. ^ "Thousands flock to Waterperry Gardens for final Art in Action festival". Oxford Mail. Retrieved 13 February 2019. ^ a b c d "Subscribe to read". Financial Times. Retrieved 5 March 2019. ^ Vetta, Sylvia (June 2012). "Guardian of Waterperry" (PDF). Oxford Times: 10–14. ^ "İlk Altın Madalya Ebru ile Geldi!". Haberler.com (in Turkish). 31 July 2012. Retrieved 22 February 2019. ^ a b "Obituary: Bernard Saunders, founder of Art in Action at Waterperry House". Oxford Mail. Retrieved 22 February 2019. ^ "2016 is Art In Action's 40th and final year. So what happened to Oxfordshire's most successful art festival? Katherine MacAlister investigates". The Oxford Times. Retrieved 27 February 2019. ^ "Best of the Best Exhibition at Art in Action". Art in Action. Retrieved 16 February 2019. ^ "Crowds flock to 'last' arts festival". BBC News. Retrieved 13 February 2019. ^ "Handmade Oxford - The International Contemporary Arts Festival". Handmade in Britain. Retrieved 17 February 2019. ^ "CCHQ Weekly Round-up, 7 December 2018 - Crafts Council". www.craftscouncil.org.uk. Retrieved 1 March 2019. ^ "Oxford Storytelling Festival". Oxford Storytelling Festival. Retrieved 17 February 2019. ^ "Our Story". Waterperry Opera Festival. Retrieved 17 February 2019. ^ Tolley, Dorine (2009). The Power Within: Leon Maclaren, a Memoir of His Life and Work. London: Booksurge Publishing. p. 282. ISBN 978-1439210307. ^ Ward, David (2014). Leon MacLaren: Memories and Tributes. School of Economic Science. p. 3. ^ "School of Philosophy And Economic Science". Dialogue Ireland.org. ^ a b "Waterperry House Project 1999–2001". Cacioppe.com. Archived from the original on 19 December 2013. Retrieved 15 November 2013. ^ "Initial Concept : Architecture: Fresco Techniques & Methods" (PDF). Cacioppe.com. Retrieved 15 October 2013. ^ "Jeffery Courtney - portrait - landscape - still life - copies - conceptual - mural - gallery artist". www.courtneyart.net. Retrieved 16 February 2019. ^ Morrison, Richard (12 July 2008). "School of Economic Science supports Art in Action festival". The Times. ISSN 0140-0460. Retrieved 27 February 2019. ^ "The most ambitious example of fresco painting in Britain". Art in Action. 26 February 2015. Retrieved 16 February 2019. ^ "House of Commons - Office of the Deputy Prime Minister: Housing, Planning, Local Government and the Regions - Ninth Report". publications.parliament.uk. Retrieved 10 March 2019. ^ "Layfield and Wistable: 25 Years on". Land&Liberty Magazine. Summer 2001. ^ "Can Taxation Support Progress". Land and Liberty Magazine. Winter 2006. ^ Mofid, Kamran. "Why Values Matter: GCGI-SES Joint 2016 Conference". Globalisation for the Common Good Initiative. Retrieved 3 March 2017. ^ "October Newsletter, introducing Ian Mason". madmimi.com. Retrieved 3 March 2017. ^ Le Fanu, James (Winter 2009). "Towards Understanding the Primacy of Consciousness". Beyond the Bran VIII: Self and Death - What Survives? : 32. ^ "Henry George Foundation". Land&Liberty. Winter 2010 – via Henry George Foundation of Great Britain. ^ "Economics for Conscious Evolution: International Land Taxation conference". Feasta. 11 June 2013. Retrieved 11 March 2019. ^ Mark (18 August 2013). "3. (2013 August) Conference: The IU". Georgist News. Retrieved 11 March 2019. ^ Mofid, Kamran. "School of Economic Science, London, Receives Second Globalisation for the Common Good Initiative (GCGI) Award". www.gcgi.info. Retrieved 6 February 2019. ^ a b "Submissions". THE COMMISSION ON LOCAL TAX REFORM. 14 March 2016. Retrieved 2 March 2019. ^ says, Anne Giles (17 June 2016). "Five of the best... places in Croydon to meet your soulmate". The Croydon Citizen. Retrieved 16 March 2019. ^ a b "Tax Trial: Land Value Tax for London?". London City Hall. 22 February 2016. Retrieved 2 March 2019. Tax Trial: Land Value Tax for London? (PDF) (Report). Greater London Authority. February 2016. ^ "Harmony With Nature". www.harmonywithnatureun.org. Retrieved 6 February 2019. ^ a b "Land Value Capture - Housing, Communities and Local Government Committee - House of Commons". publications.parliament.uk. Retrieved 2 March 2019. ^ a b Pluralism, Promoting Economic. "Network Archive". PEP - Promoting Economic Pluralism. Retrieved 2 March 2019. ^ a b "Events – The Mint Magazine". Retrieved 2 March 2019. ^ a b Evans, Jules (2013). Philosophy for life and other dangerous situations. London: Rider. ISBN 9781846043215. OCLC 820781877. ^ Palmarossa, Paul. (2006). From principles to profit : the art of moral management. Rees, Chris, 1966-. London: Arcturus. ISBN 0572031920. OCLC 83756360. ^ a b "Advaita philosophy". School of Economic Science. Retrieved 16 February 2019. ^ a b c Crammond, Joan (2004). Sheila Rosenberg: A Renaissance Lady. London: Godstow Press. ASIN B00TYZJ300. ^ Dennis, Waite (2018). Western philosophy made easy. UK: John Hunt Publishing. ISBN 9781785357787. ^ Souter, Fenella (20 November 2008). "Mad about Hugh". Sydney Morning Herald. ^ Chryssides, George D. (2006). The A to Z of New Religious Movements. Scarecrow Press. p. 287. ISBN 978-0-8108-5588-5. ^ Dennis, Waite (21 June 2018). Western philosophy made easy. Alresford, Hampshire, UK: Iff Books (John Hunt). ISBN 9781785357787. OCLC 1050438681. ^ V., Barrett, David (1996). Sects, cults, and alternative religions: a world survey and sourcebook. London: Blandford. ISBN 0713725672. OCLC 36909325. ^ Dennis., Waite, (2010). Back to the Truth : 5000 years of Advaita. Lanham: O-Books. ISBN 9781846946240. OCLC 727648341. ^ Mofid, Kamran. "The Value of Values in Economics: Peter Bowman". Globalization for the Common Good. Retrieved 9 April 2019. ^ "Economics with Justice Archives". School of Economic Science. Retrieved 15 February 2019. ^ "Coalition for Economic Justice". ^ Mason, Ian (2014). One World One Wealth. London: School of Economic Science. p. 11. ISBN 978-0-956-5968-3-3. ^ a b c "Practical Philosophy and Economics with Justice". The VoiceAmerica Talk. Retrieved 14 March 2019. ^ McNab, Jane; Tuck, Jacqueline (2015). How the reputation of Georgists turned minds against the idea of a land rent tax (PDF) (Report). ^ Mofid, Kamran. "The Value of Values in Economics". www.gcgi.info. Retrieved 4 March 2019. ^ King, Mike (Summer 2013). "Can Economics be a Science?". Scientific and Medical Network Review. 112. ISSN 1362-1211. ^ MacLaren, Leon; Makewell, Raymond (2013). The science of economics : the economic teaching of Leon MacLaren. ISBN 9780856832918. OCLC 827258190. ^ a b "Henry George International Education Center - Georgist Organizations Worldwide". ceihg.org. Retrieved 2 March 2019. ^ a b "Council of Georgist Organizations Directory". www.cgocouncil.org. Retrieved 2 March 2019. ^ Moss, Laurence S. (2008). Henry George : political ideologue, social philosopher and economic theorist. Malden, MA: Blackwell Pub. ISBN 9781405187510. OCLC 226356135. ^ Lee, Geoffrey (2008). The people's budget : an Edwardian tragedy (Rev. ed.). London: Shepheard-Walwyn. ISBN 978-0856832628. OCLC 260250596. ^ a b J.,, Snow, Michael (2018). Mindful philosophy. Milton Keynes. ISBN 9781546292388. OCLC 1063750429. ^ Boddy, David. Mind your head : an emotional intelligence guide for school leaders. [Melton, Woodbridge]. ISBN 9781908095626. OCLC 828415050. ^ "Meditation". School of Practical Philosophy. Retrieved 3 March 2017. ^ The Letters of Marsilio Ficino. Vol. 1. Shepheard-Walwyn Publishers. 1975. ISBN 978-0-85683-010-5. ^ Obituaries, Telegraph (21 May 2018). "Clement Salaman, authority on the philosopher Ficino – obituary". The Telegraph. ISSN 0307-1235. Retrieved 5 March 2019. ^ Trismegistus., Hermes, (2001). The way of Hermes. Salaman, Clement., Oyen, Dorine van., Wharton, William D., Mahé, Jean-Pierre. London: Duckbacks. ISBN 0715630938. OCLC 59544774. ^ "BBC Radio 4 - In Our Time, Heaven". BBC. Retrieved 11 March 2019. ^ "BBC Radio 4 - In Our Time, The School of Athens". BBC. Retrieved 11 March 2019. ^ Waite, Dennis (2014). Sanskrit for Seekers. London: MANTRA BOOKS. p. 12. ISBN 978-1782792277. ^ "9.30am: Sanskrit Foundation Course - Part 8". School of Economic Science. Retrieved 7 February 2019. ^ "Ian Mason". Strand Chambers. Retrieved 5 November 2016. ^ Mofid, Kamran. "2nd: School of Economic Science". www.gcgi.info. Retrieved 5 November 2016. ^ "Harmony with Nature". www.harmonywithnatureun.org. Retrieved 5 November 2016. ^ "Waterperry House". School of Economic Science. Retrieved 15 November 2013. ^ "Nanpantan Hall". School of Economic Science. Retrieved 15 November 2013. ^ "Brinscall Hall". Practical Philosophy. Archived from the original on 5 February 2011. ^ "School of Economic Science". Retrieved 15 November 2013. ^ a b c Chryssides, George D. (1999). Exploring new religions. London: Cassell. ISBN 9780304336517. OCLC 319493623. ^ "A school for self-discovery". School of Practical Philosophy. Retrieved 10 January 2019. ^ Kaminer, Ariel (15 January 2010). "Practical Philosophy Aims to Cultivate an Everyday Wisdom". The New York Times. ISSN 0362-4331. Retrieved 19 December 2018. ^ Clarke, Camille. "School of Philosophy stages quiet walk at Trinity Cathedral". www.guardian.co.tt. Retrieved 13 March 2019. ^ Medenbach, Deborah (31 August 2008). "Practical Philosophy puts thinking to the test of daily use". Times Herald-Record. Retrieved 15 November 2013. ^ "The School Of Practical Philosophy". findthecompany.com. ^ "New York State Certification". School of Practical Philosophy. Retrieved 15 November 2013. ^ Hausman, Catherine (1997). The Manhattan Family Guide to Private Schools. Soho Press. ISBN 978-1-56947-086-2. Retrieved 15 November 2013. ^ Murphy, Meghan E. (31 December 2009). "Loss of 18th-century home to blaze revives road dispute". Times Herald-Record. Retrieved 15 November 2013. ^ "School of Practical Philosophy Changes the Tagline on Its Subway Posters". Observer. 20 September 2011. Retrieved 25 March 2019. ^ Lewis, Judith (7 January 2007). "A reverie runs through it". The Los Angeles Times. ^ "Curriculum – Philosophy Works – Introductory Course". The School of Practical Philosophy. ^ "Hugh Jackman relishes performing". Today.com. ^ Scobie, Claire (18 December 2008). "Hugh Jackman: X appeal". The Daily Telegraph. ^ • Slee, Colin (1999). "New Religious Movements and the Churches". In Wilson, Bryan R.; Cresswell, Jamie (eds.). New Religious Movements: Challenge and Response. Routledge. p. 170. ^ Chryssides, George D. (1999). Exploring New Religions. Continuum International Publishing. p. 374. ^ Walsh, Yvonne; Russell, Robin J.H. ; Wells, Pamela A. (September 1995). "The personality of ex-cult members". Personality and Individual Differences. 19 (3): 339–344. doi:10.1016/0191-8869(95)00074-g. ISSN 0191-8869. ^ Partridge, Christopher H., ed. (2004). Encyclopedia of new religions : new religious movements, sects and alternative spiritualities. Oxford: Lion. ISBN 978-0745950730. OCLC 53390430. ^ Shantanand Saraswati, Swami (2004). Good company : an anthology of sayings, stories and answers to questions. London: The Society for Study of Normal Psychology. ISBN 978-0954793906. OCLC 70043618. ^ a b c d Boddy, David (2012). Mind your head : an emotional intelligence guide for school leaders. ISBN 9781908095626. OCLC 828415050. ^ a b "Cult schools: parents seek a bigger say" (PDF). London Evening Standard. 9 June 1983. Retrieved 3 February 2017. ^ "The secrets of the secretive sect" (PDF). London Evening Standard. 8 June 1983. Retrieved 3 February 2017. ^ a b c Hounam, Peter; Hogg, Andrew (1984). Secret Cult. Lion Publishing. p. 142. ISBN 978-0-85648-837-5. ^ Wilson, Bryan R.; Cresswell, Jamie (1999). New religious movements : challenge and response. London: Routledge. ISBN 978-0203159910. OCLC 49569353. ^ Shaw, William (1994). Spying in Guru Land : inside Britain's cults (Pbk. ed.). London: Fourth Estate. ISBN 978-1857023299. OCLC 34900500. ^ "Philosophy for grown-ups". The Independent. 19 March 1995. Retrieved 5 March 2019. ^ Morrison, Richard (12 July 2008). "School of Economic Science supports Art in Action festival". The Times. ISSN 0140-0460. Retrieved 23 March 2019. ^ S., Balsekar, Ramesh (2007). Confusion no more : for the spiritual seeker. London: Watkins. ISBN 9781905857142. OCLC 148999783. ^ A J, Carter (January 1963). "The Road to Realisation". Land & Liberty: 14. ^ Hounam, Hogg, Peter, Andrew (1985). Secret Cult. Lion Publishing Plc (1985). pp. 280–287. ISBN 978-0856488375. ^ Hodgkinson, Brian (2010). In Search of Truth: The Story of the School of Economic Science. London: Shepheard-Walyn (publishers) LTD. p. 250. ISBN 978-0-85683-276-5. ^ Frank., Crocitto, (2000). Insight is better than ice cream (1st ed.). New Paltz, N.Y.: Candlepower Communications. ISBN 0967755808. OCLC 68706342. ^ 1939-, Lippe, Toinette, (2002). Nothing left over : a plain and simple life. New York: J.P. Tarcher/Putnam. ISBN 158542160X. OCLC 48249006. ^ "Oprah Interviews Hugh Jackman". O, The Oprah Magazine. June 2006. ^ a b "Hugh Jackman". GQ. 28 November 2010. Retrieved 15 October 2013. ^ "Hugh Jackman: datos curiosos que tal vez no conocías". Tomatazos (in Spanish). Retrieved 22 February 2019. ^ Klett, Leah Marieann (9 October 2015). "Hugh Jackman Opens Up About Christian Faith, Says He Seeks to Honor God With His Films". Breaking Christian News: World, Business, and More | The Gospel Herald. Retrieved 22 February 2019. ^ Child, Ben (1 April 2015). "Hugh Jackman to star as the apostle Paul in high-profile Christian film". The Guardian. ISSN 0261-3077. Retrieved 22 February 2019. ^ Magazine, Insights. ""Spirituality connects me better to life" – Hugh Jackman". Insights Magazine. Retrieved 22 February 2019. ^ Souter, Fenella (20 November 2008). "Mad about Hugh". The Sydney Morning Herald. Retrieved 22 February 2019. ^ 1929-, Wilson, Stephanie, (2007). There's no more dying then : words of comfort and illumination. London: Shepheard-Walwyn (Publishers) Ltd. ISBN 9780856832529. OCLC 233787385. ^ Clark, Mairi (20 July 2012). "The Drum speaks to Jeremy Sinclair of M&C Saatchi to talk about the brutal simplicity of thought". TheDrum.com. Retrieved 3 March 2017. ^ Fendley, Alison (1996). Saatchi & Saatchi : the inside story (1st U.S. ed.). New York: Arcade. ISBN 978-1559703635. OCLC 34996064. ^ Goldberg, Philip (2013). American Veda : from Emerson and the Beatles to yoga and meditation--how Indian spirituality changed the West (First paperback ed.). New York: Three Rivers Press. ISBN 9780385521352. OCLC 808413359. ^ "Interfaith Seminary, Faculty/Teachers - New York, globally over webinars". One Spirit Learning Alliance. Retrieved 2 March 2019. ^ "SES and its strange schools" (PDF). London Evening Standard. 9 June 1983. Retrieved 3 February 2017. ^ Paton, Graeme (2006). "Inquiry reveals culture of violence" (PDF). Times Education Supplement (TES). Retrieved 3 February 2017. ^ McDermott, Jo (19 January 2006). "10 years of abuse" (PDF). Kensington & Chelsea News. Retrieved 3 February 2017. ^ MacDonald, Victoria (15 March 2006). "Abuse at 'cult' schools". Channel 4 News. Channel 4. Retrieved 31 December 2016. ^ Harvey, Chris (25 February 2014). "Emily Watson interview: 'I've never done anything gratuitous'". The Daily Telegraph. Retrieved 3 March 2017. ^ "Emily Watson on her Apple Tree Yard role: 'Sexuality is powerful at 50'". Radio Times. 22 January 2017. Retrieved 3 March 2017. ^ a b Thomas, David (30 September 2000). "Rising from the Ashes". Irish Independent. ^ "Issues". School of Economic Science. Archived from the original on 6 June 2009. Retrieved 15 November 2013. ^ "Who's Who". Stjamesinquiry.org. Archived from the original on 24 February 2012. Retrieved 15 October 2013. ^ 1944-, Gould, Allan, (1986). The new entrepreneurs : 80 Canadian success stories. Toronto: McClelland and Stewart-Bantam. ISBN 0770420923. OCLC 23900735. ^ 1433-1499., Ficino, Marsilio (1975). The letters of Marsilio Ficino. London: Shepheard-Walwyn. ISBN 9780856830105. OCLC 1899379. ^ 1433-1499., Ficino, Marsilio (2018). The letters of Marsilio Ficino. London: Shepheard-Walwyn. ISBN 9780856830105. OCLC 1899379. ^ a b Leon., MacLaren (2010). Reminders : extracts from lectures. School of Economic Science. ISBN 9780956596802. OCLC 678881536. ^ Śaṅkarācārya,. Self illumination : the Svātmaprākaśikā of Śrī Śaṅkara Ācārya. Śaṅkarācārya., Jessup, Warwick,, School of Economic Science (London, England),. London. ISBN 9780956596895. OCLC 993268581. ^ Sankara., Acarya, Sri (2014). The teaching of reality : Sri Sankara Acarya's Tattvopadesa. Jessup, Warwick. London: School of Economic Science. ISBN 9780956596857. OCLC 909158023. ^ Jessup, Warwick & Elena (2018). The Eternal Way. London: The School of Economic Science. ISBN 978-0-9955172-6-4. ^ 788-820, Śrī Śaṅkara Ācārya. Reflection on Brahman : Brahmānucintanam. Śrī Śaṅkara Ācārya : a new translation. School of Practical Philosophy. Sanskrit Faculty. Wahroonga, N.S.W. ISBN 9780646969138. OCLC 981123890. ^ The Teachings of Aṣṭāvakra in simple Sanskrit. London: Sanskirt Faculty of the School of Economic Science. 2016. ^ 1910-1994, MacLaren, Leon. Music : the foundations of harmony (Revised ed.). London. ISBN 9780956596840. OCLC 874928840. ^ MacLaren, Leon (2010). Nature of Society: and Other Essays (2nd ed.). UK: School of Economic Science. ISBN 9780956596819. ^ Maclaren, Leon (2001). Justice - The transcript of a lecture delivered on 19th December 1951. London: The School of Economic Science. ^ Leon., Maclaren (2014). Music : the foundations of harmony. [Place of publication not identified]: School Of Economic Scienc. ISBN 978-0956596833. OCLC 922599805. ^ A practical aid for the study of Sanskrit dhātus. (2003). London: The school of economic science. ^ (Lawgiver), Manu. The laws of Manu : a new translation. School of Economic Science (London, England). Language Department. London. ISBN 978-0856835230. OCLC 1019591595. Charity Commission. The Fellowship of the School of Economic Science, registered charity no. 313115. Swami Dayananda Saraswati was a renunciate of the Hindu order of sannyasa and a renowned traditional teacher of Advaita Vedanta, and founder of the Arsha Vidya Gurukulam. He was the spiritual Guru of prime minister Narendra Modi. Advaita Vedanta, originally known as Puruṣavāda, is a school of Hindu philosophy, and one of the classic Indian paths to spiritual realization. The term Advaita refers to its idea that the true self, Atman, is the same as the highest metaphysical Reality (Brahman). The followers of this school are known as Advaita Vedantins, or just Advaitins, and they seek spiritual liberation through acquiring vidyā, meaning knowledge, of one's true identity as Atman, and the identity of Atman and Brahman. In spirituality, nondualism, also called non-duality, means "not two" or "one undivided without a second". Nondualism primarily refers to a mature state of consciousness, in which the dichotomy of I-other is "transcended", and awareness is described as "centerless" and "without dichotomies". Although this state of consciousness may seem to appear spontaneous, it usually follows prolonged preparation through ascetic or meditative/contemplative practice, which may include ethical injunctions. While the term "nondualism" is derived from Advaita Vedanta, descriptions of nondual consciousness can be found within Hinduism, Buddhism, and western Christian and neo-Platonic traditions. Jñāna yoga, also known as Jnanamarga, is one of the several spiritual paths in Hinduism that emphasizes the "path of knowledge", also known as the "path of self-realization". It is one of the three classical paths (margas) for moksha. The other two are karma yoga and bhakti yoga. Later, new movements within Hinduism added raja yoga as a fourth spiritual path, but it is not universally accepted as distinct to the other three. Swami Brahmananda Saraswati was the Shankaracharya of the Jyotir Math monastery in India. Born into a Brahmin family, he left home at the age of nine in search of a spiritual master. At age fourteen he became a disciple of Svāmī Krsnānanda Sarasvatī. At the age of 34, he was initiated into the order of Sannyas and became the Śaṅkarācārya of Jyotir Math in 1941 at age 70. His disciples included Swami Shantanand Saraswati, Transcendental Meditation founder Maharishi Mahesh Yogi, Svāmī Swarūpānanda Sarasvatī and Swami Karpatri. According to the partisans of Shantānand Saraswati, Brahmānanda made a will five months before his death in 1953, naming Shantānand as his successor. Sri Satchidanandendra Saraswati Swamiji was the founder of the Adhyatma Prakasha Karyalaya in Holenarasipura, Hassan district, Karnataka, India. He was a great Vedantin of Advaitha Philosophy. St James' Independent Schools in London (UK) are three fee-paying schools for children aged 4 to 18. The Juniors' and Senior Girls' Schools are in the London Borough of Hammersmith and Fulham, and the Senior Boys' School in Ashford, Surrey. Sukhasana Sanskrit: सुखासन; IAST: Sukhāsana, easy pose, is an asana in hatha yoga, Buddhism, and Hinduism, similar to sitting in a simple cross-legged position. 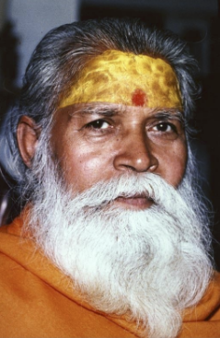 Swami Krishnananda Saraswati was a disciple of Sivananda Saraswati and served as the General Secretary of the Divine Life Society in Rishikesh, India from 1958 until 2001. Author of more than 40 texts, and lecturing extensively, on yoga, religion, and metaphysics, Krishnananda was a prolific theologian, saint, yogi and philosopher. Leon MacLaren, born Leonardo da Vinci MacLaren, (1910–1994) was a British philosopher and the founder of the School of Economic Science (SES). MacLaren was inspired by Henry George, Socrates, Dr Francis Roles, Pyotr Ouspensky, Maharishi Mahesh Yogi, and finally the philosophy of Advaita Vedānta through the Shankaracharyas of Jyoti Math. to advance the education of the public in religion, science, philosophy and the arts. Swami Shantanand Saraswati (1913-1997) was Shankaracharya of the Jyotir Math monastery from 1953 to 1980, he was a disciple of Brahmananda Saraswati and succeeded him as Shankaracharya.